WIN! €200 Hamper from Roger & Gallet! Continuing on with the site’s third birthday celebrations I have an absolute doozy of a prize for you today – a hamper jampacked with all sorts of French fanciness from Roger & Gallet, worth a massive €200. I absolutely adore this gorgeous brand: the Citron and Gingembre scents are amongst my favourites and I always have one or t’other in my handbag. The new Fleur des Figieur collection smells like heaven itself, and the shower gels inject a little piece of silky soft luxury into my every day life. The winner will get to try out some of Roger & Gallet’s bestsellers or, since everything this brand produces makes the most delectable gift, you could save yourself a few bob on birthday or Christmas pressies for just about anyone you know! Due to postage restrictions, we can’t send this one outside Ireland BUT a worldwide giveaway will be happening on my YouTube channel soon, so do head over and subscribe for that! Just pop your details into the widget above - and good luck! What a super duper prize! I've never tried this brand so it would be great to win & give it a go! I have always wanted to try Roger & Gallet and this seems like the perfect way to do it!! 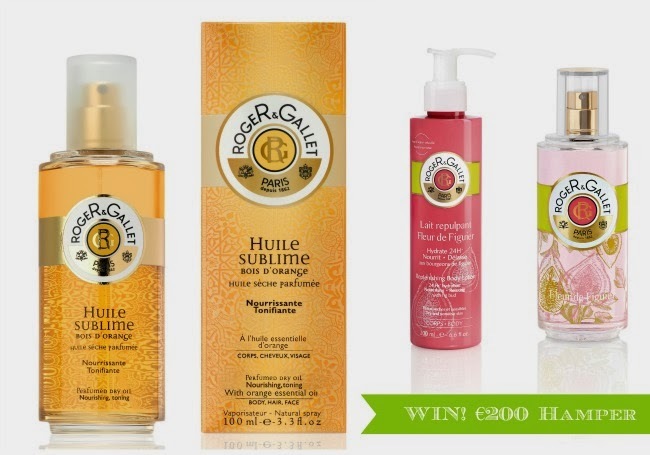 I've never tried anything by Roger & Gallet so this giveaway is exciting! Awesome giveaway my first ever perfume was a Roger & Gallet when I was 10 or 12. Thank you! I'd have more than enough to share with my mother and sister if I won this.... Wow!!! Great prize, Emma. I adore their Bois D'Orange hand cream. What fabulous giveaways! I've always wanted to try this brand! Emma! Can't believe all the amazing giveaways of late! Great prize, put me in the hat please! Very nice! Love Roger and Gallet - the scents are fantastic! I'd love to win something this nice, a real treat. Happy birthday! thank you for the wonderfull giveaway! I love Roger & Gallet products, would be a great prize to win! Another amazing giveaway, thank you! Love R&G. Scents always remind me of summer and holidays. <3 Entered, Liked & Shared :) Fab givaway :) Fingers & Toes crossed!! Please :) <3 fab giveaway! Love this comp. Thanks so much. Fingers crossed. So superficial, but I adore the packaging! Want! This would be a great xmas gift.. To myself!!! wooo!great comp, hope i win! Just watched your video on lippie! Great tips, and now I know to look our for the cascade products! Wonderful giveaway! Well done you! Fantastic prize, would so love this! Count me in. My hair could use a treat! Love Roger and Gallet, Fleur de Figeur is gorge, so is the Citron! Love it! would be some treat! Fab prize, love Roger and Gallet! I would love to win this. I was literally in the chemist yesterday looking longingly at that stuff! Prizes don't get much more luxurious than Roger & Gallet! This would make a perfect birthday & Christmas present for my deserving sis!